The export value of UK education and training is £28bn, more than that of financial services, a report says. The Sheffield University research includes the fees and living expenses of international students. It also considered consultancy and training services and sales of educational materials including books, journals and software. The British Council said the UK needed to take education more seriously as a global business to avoid losing out. The council published a report based on the research, Global Value: The Value of UK Education and Training Exports, as part of its role in promoting worldwide appreciation of the UK. The figures relate to 2003-04. 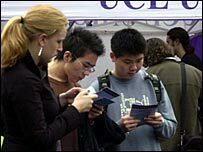 The direct value of overseas students was said to be £8.5bn, 39% higher than two years earlier. The estimated total compared with £19bn for financial services and £20bn for the automotive industry, £14bn for healthcare service exports £7bn for construction exports and £9.4bn for food and drink. Chief executive Martin Davidson said: "It's fantastic to have the true financial value of education to our economy confirmed. "Fundamentally this report shows the shift of axis of our education system from one that operates predominantly domestically to one that operates on a truly international basis. "However, our position is vulnerable. Unless we start taking education much more seriously as a global business, we will lose out to other countries who understand the value of education to their economy much better than we do."